Summary: Warren Orr was born March 20, 1943 in West Frankfort, Illinois and entered the service on March 22, 1963 in Moline, Illinois. As a Captain, he was Civil Affairs Officer, Company C, 5th Special Forces Group. 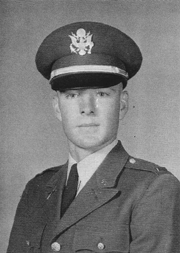 Captain Orr was listed as MIA on May 12, 1968 after he was assigned to the Kham Duc Special Forces Camp (near DaNang) to assist in the evacuation of all personnel, prior to an imminent North Vietnamese attack on the camp. He was last seen boarding an Air Force C-130 aircraft after all Vietnamese civilians were on board. According to a report from a forward air controller flying in the area, the plane exploded in mid-air after taking heavy enemy ground fire, and it crashed about a mile from the camp. The plane was totally destroyed except for the tail boom. In 1986 and 1991, U.S. Officials received remains and ID tags from sources claiming they belonged to men from this action. Scientific analysis revealed they were not American remains, but it was believed the Vietnamese sources knew where the crash site was located. In 1993, a joint/U.S.-Socialist Republic of Vietnam (SRV) team, led by the Joint POW/MIA Accounting Command (JPAC), traveled to Kham Duc and interviewed four local citizens concerning the incident. They led the team to the crash site and turned over remains and ID Tags they had recovered in 1983 while looking for scrap metal. During this visit the team recovered human remains and aircraft wreckage at the site.In 1994, another joint team excavated the crash site and recovered remains, pieces of life-support equipment, crew-related gear and other personal effects. JPAC scientists used forensic identification tools and circumstantial evidence in the identification of the remains. MIA, May 12, 1968…listed as KIA, February 1, 1974. Remains were identified by Hawaii lab in October 2007. Bob, How I have missed you all these years, so many tears. So many memories. I remember the last time I saw you, you had completed your first year in Viet Nam and were headed to Fort Benning for Infantry OCS when I dropped you off at the bus station. Our last words, I Love You. Well as I’m sure you know, one of your Dog Tags and some skeletal remains were finally found at the crash site and DNA showed positive that it was you. You were buried at Arlington last winter (2008). My son asks about you often and even though you never met he misses you. Brothers in Life and Brothers in War. Just so you know, I Love You, and after all these years, WELCOME HOME.” Greg Orr, Brother, Aug 14, 2009.